Mifflin County’s Eleana Eckley (7) puts the ball in play during the District 6 Class 6A softball championship game Wednesday in Loretto. 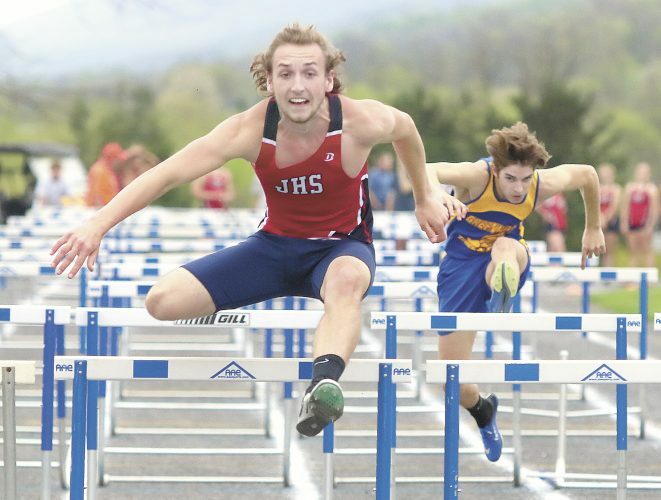 LORETTO — It was a story that needed a happy ending at some point for Mifflin County, and it got that Wednesday at Saint Francis University. In defeating State College 5-4, the Huskies captured the District 6 Class 6A softball championship. It ended a four-game losing streak to the Little Lions by girls teams in championship games. Mifflin County (15-5, 11-4) will play District 10 champion Erie McDowell — which got a free pass when no other school contested it in that tournament — May 31 at Penn State-Behrend at 4:30 p.m. 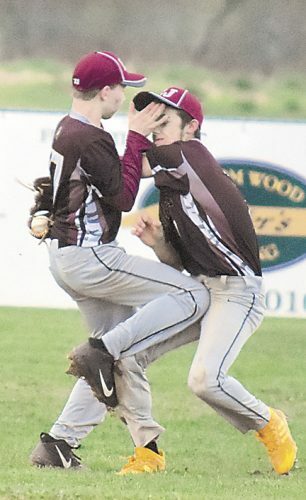 The winner of that play-in game advances to the state tournament, which will be played in the winner’s district on June 4 against the third-place finisher out of District 7. It wasn’t easy, and the Huskies were forced to put the game away in their last at-bats, but the local team didn’t expect anything less from a squad with which it split the regular season series. That the Little Lions did. With the Huskies holding on to a one-run lead and needing only three defensive outs, State College struck even in seemingly a blink of an eye — or three pitches. First pitch swinging, Morgan Arnold turned on Hanna Kanagy and ripped the ball to left, rolling to the fence for a leadoff double. 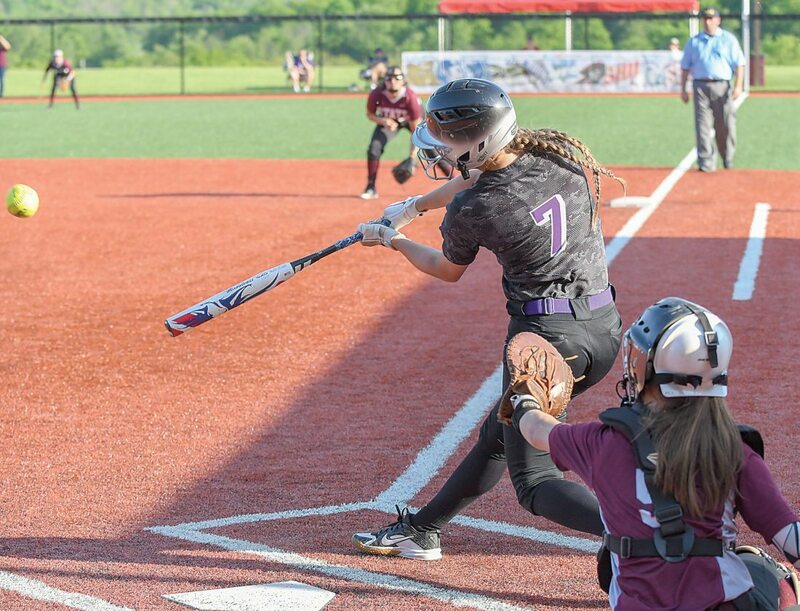 Two pitches later, Caitlyn Brannon singled in Arnold to tie the game at four, leaving many Mifflin County fans in attendance wanting to believe the season wasn’t going to end in heartbreak to the same team — again. Kanagy and the Huskies had a different idea and worked their way out of a jam, leaving the go-ahead run stranded at second to set up the heroics. Maxie Johnson was the team’s No. 9 hitter, but she served as the leadoff in the seventh and did her job by singling up the middle to put pressure on State College immediately. She was sent back to the dugout on a fielder’s choice off the bat of Sydney Orwig, but Orwig played a critical role by getting into scoring position when the infield opted to get Eleana Eckley at first. The Lions then intentionally walked Olivia Ahern to get a force at any base and go after Alyssa Schnell, who up to that point was 0-for-3 with a pair of groundouts. She certainly did. After fouling off three pitches Schnell ripped a line drive to left that rolled deep enough to score Ahern and walk the Huskies off winners. At that moment, McCurdy couldn’t have been prouder of what he saw happen before his eyes and seeing many of his players holding onto the medals around their necks as if someone were going to snag them away. Winning games is often about making the adjustments during games, and on more than one occasion, the Huskies did just that. Kanagy, for instance, got hit around some in the first inning with the Lions striking for three runs off two hits and three walks. All three came around to score on a bases-clearing double by Sara Conklin that was hit so hard it ricocheted off the fence. Both Orwig and Maddie Amspacker were closing in on it and it went right between the two in the direction of the infield. Seeing two of those runs happen due to walks had Kanagy knowing she had to change something. She didn’t allow a run between the second and sixth innings. Instead, she only gave two free passes the rest of the way and struck out seven. The other big adjustment was something Kanagy was on to. The team was going to pick her up. State College starter Emma Wolfe was in a rhythm herself going into the home half of the fifth, retiring 12 straight batters dating back to the last three outs in the first. None of that mattered when Selena Breneman got a pinch-hit double to kick things off in the frame. Sabrina Stuck followed suit with a double of her own to score Breneman. It looked like Wolfe may have been able to limit the damage, getting two quick outs and keeping pinch-runner Ralie Goss at second. Instead, the Huskies had their first dose of two-out magic when the lineup turned over, striking for three straight RBI hits from the top of the lineup. Orwig singled in Goss and came around to score on Eckley’s double to center. 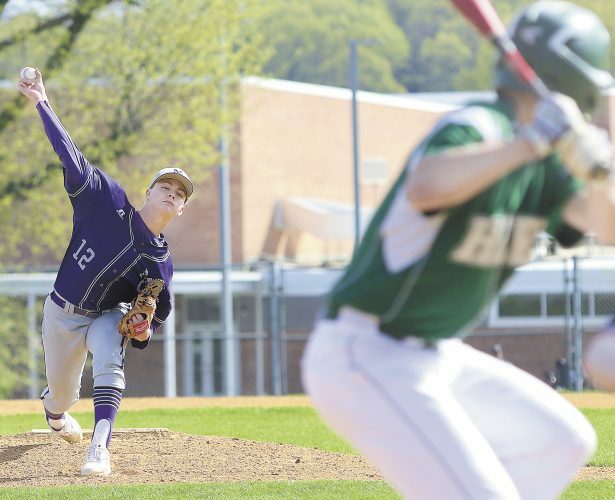 The Huskies struck once more when Ahern singled up the middle on the second pitch of the at-bat to give Mifflin County its first lead. McCurdy is hopeful he’ll see more of what worked Wednesday in the play-in game. WP: Hanna Kanagy. LP: Sophia Keene. SO: Emma Wolfe 3, Keene (SC); Kanagy 7 (MC). BB: Keene 2 (SC); Kanagy 5 (MC). 2B: Morgan Arnold, Sara Conklin (SC); Eleana Eckley, Sabrina Stuck, Selena Breneman. MH: Arnold 3-for-4, Caitlyn Brannon 2-for-2 (SC); Eckley 2-for-4 (MC). RBI: Brannon, Conklin 3 (SC); Sydney Orwig, Eckley, Olivia Ahern, Alyssa Schnell, Stuck (MC). A correction was made to the online edition crediting Sabrina Stuck with the RBI double.